Home loan is that money, given especially by the bank or an institution that does the business of lending loan on interest rate to the loan aspirant. 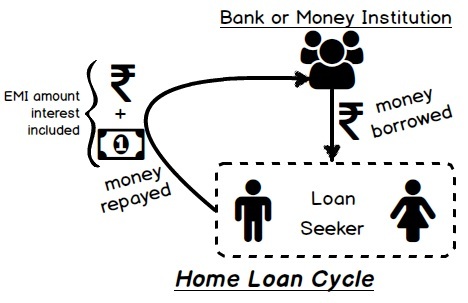 This simple image representing the home loan cycle. Home loan serves very helpful for the people who are in need in place for shelter. This is good option for the people who do not have enough money or if they do not have upfront money to buy home(flat). Based on money seeker earnings either from job or own self-employed set-up, bank/private institution will lend money and will also mortgage of the property(home) will be done from the builder/property seller depending on the terms agreed upto along with interest rate applied. Repayment of the loan amount will be done with interest rate in EMI(Easy Monthly Installments) it can be postdated cheques(PDC) issued or using newly introduced payment method called Electronic Clearing System(ECS) where amount is auto-debited from the loan account. Certain mandates need to be fulfilled with the bank before availing benefits of ECS facility. Once the loan borrower re-pays amount back with full loan amount along with interest agreed upon to pay through small amount(principal amount + interest)bundled which is repaid each month generally referred as EMI. Then the whole ownership of that property is fully then transferred into the loan payer's name by the bank or money lending institution. The purpose of putting up these conditionsfrom bank's or money lender point of view is to ensure that loan seeker comfortably repays the loan amount on time without hassle.There are basic eligibility requirement which is required and needs to be fulfilled mandatorily to get a loan on property. Every bank has almost similar eligibility criteria while differing in very little in order toproperly evaluate your money repaying capacity. The money repayment abilityusually depends on the monthly income if you are working in job or self-employed incomeand other surplus income factor. Banks or money institution verifies both property and loan seeker thoroughly before they sanction the loan and for that certain norms are followed. For property they examine the property with respect to the minimum area requirements for a flat/house/row house/villa which can be in carpet area or built up area. Loan lender also scrutinize the age of the property in case if theloan is not for fresh property, the location of the property is also an important factor and name of the builders in terms of decent reputation who is constructing the property. Complete analysis is done followed by inspection of the property to check whether the title is clear, local municipal authority issued as NOC(No Objection Certificate) or not and last but not the least an additional check is done like ownership disputes etc. Loan seeker should be not minor i.e. above 21 years should be a proper PAN card holder if the applicant is not NRI*. Maximum age to avail loan can be between 55 to 60 years depending upon the gross/net income. If you are the one who already have any previousEMI's or loans stillpending then beware under the bank consideration you will always be risky factor for them and providing you more loan for property purpose will be a question for finance provider people. EMI's or loans stillpending may even led to you as defaulter of SEBI. There is always upper age limit set for home loan applicants so that lender can get their money back before loan seeker gets retired. Loan seeker should be salaried working or self-employed. Less the age towards retirement more the loan amount would be sanctioned. Other contributing factors like your no. of dependents in your family, spouse's(wife or husband) income, assets, liabilities, and so on. You should not be listed in the defaulters list of SEBIand based on that you will be getting loan. At SEBI, to generate credit score PAN card is the medium and with that credit history is also maintained. Your SEBI's credit score is the key where your credit in the loan market is evaluated and it should be good enough in order to avail maximum and loan easily. Rest other factors like age is the very important factor of the applicant and number of years remaining for the job service also remains to be deciding factor for availability of loan amount. Please note maximum availability of loan is 85 to 90% of the asset value rest 15% need to be paid as down payment. Maximum numbers of years of loan offered by bank is for 30 years.Also remember that the longer the period of loan costlier would be the loan as loan seeker has to pay more interest depending on loan duration and loan EMI would be less. In the case where loan seeker is falling short of loan amount in such a case by involving a co-applicant can do enhancementloan seeker's loan amount to get the required money. So who can be the co-applicant for it? Co-applicant can be spouse i.e. wife/husband, father/mother or any relative or a very close friend. With that total eligible income for availing a home loan increases and thus as a result the loan eligibility becomes higher. However banks permit only certain relationships to become the co-applicant. As mentioned above, every bank has its own set of conditionalcriteria for giving loan. In the events whenloan approach is doneat the door of NBFCs(Non-Banking Financial Company) or private money lender who are not operating under full banking license or is not closely observed by RBI loan seeker can expect higher eligibility. Remember and keep informed to the people near you who are approaching for home loan agreement. Ensure to have a checklist of all the things to clear out while signing on the required documents. Here are some of the helpful pointsthat you can remember it so to you can get a fair deal. Home loans are available majorly from different types of lenders one which is known to everyone is the commercial banks, other options are scheduled banks or private finances offering home loan and companies who are especially intohousing finance only like DHFL. Each of them are different andit will give you quotation with different rates of interest and each one has differing terms and different sets of conditions, so fold your sleeves and contact several lenders to make sure it suits and fits you get the decent deal and serves value for your money. Find out down payment amount that you will need to pay with other cost involved in the loan including processing fees, administrative charges and prepayment charges imposed by banks. Just by knowing just EMI amount or the interest rate charge is not sufficient enough. Also get to know info on the loan amount, loan tenure, and how are rate of interest fixed or floating,so that you can compare the details and take amarket surveyed decision. After deciding and doing lots of market research you come to conclusion and choose the lender who provides handsome loan deal. Now comes the next crucial part where you will do the repayment of loan amount in the form of monthly installments over a period of time. Installment is calculated on loan formula and its calculation needs to be understood well precisely by the load seeker. Using our home loan Calculator you can get an idea for your total monthly EMI as per your loan amount with interest rate. This allows you plan for future expenses and total expenditure that you get by purchasing a home using bank loan. Now time to understand with simple example which will make you understand EMI calculation formula in broadly manner. Arithmetically, down is the EMIs formula we will put some values to it. 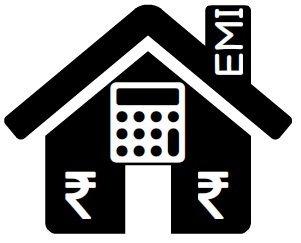 Let's calculate the EMI for a loan of Rs. 17,00,000(17 lakhs) @ 8.35 % p.a. interest rate for 25 years. EMI contains both the interest rate and principal portion of the loan amount. And this included amount calculated as EMI has to be paid each month i.e. 300 months as of above example by the loan seeker. For more information on loan or loan requirement feel free to connect with us.